After being battered by Dutch elm disease and then emerald ash borers, Kevin Sayers says the number of trees in metro Detroit and Michigan’s other urban centers has nowhere to go but up. Rebecca Salminen Witt, president of the Greening of Detroit, says Michigan has been particularly hard hit because in many cases emerald ash borers killed ashes that were themselves planted to replace lost elms. She says the two events significantly reduced the metro area’s canopy cover–the amount of an area visibly covered by treetops when viewed from the air. 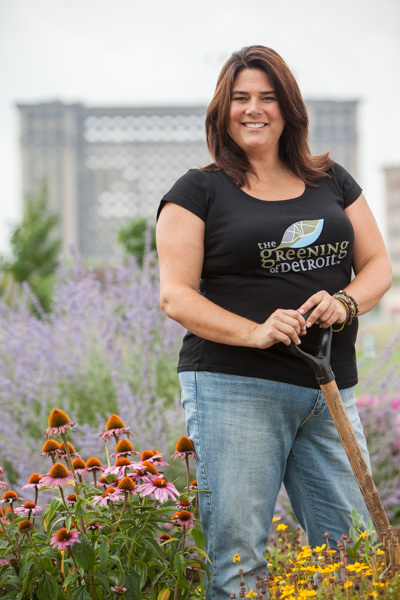 Rebecca Salminen Witt, president of the Greening of Detroit“Really, across the state and particularly the metropolitan area, we’ve still got a ways to go just to recover from the emerald ash borer crisis, much less to get to the optimum 40-45 percent canopy number,” Witt says. And as the metro area works to rebuild its tree population, there are significant benefits to be unlocked. Witt rattles off a list of them, from the fact that trees can increase property values to the numerous studies finding that trees and other natural features increase mental and physical wellbeing. They can also increase the wellbeing of a city’s infrastructure itself. Witt notes that the asphalt, concrete, and steel in a major city can make an urban area significantly warmer, in what’s known as aheat island effect. But adding tree cover can mitigate that effect and increase the lifespan of the manmade materials that cause it–notably, for Michiganders, the asphalt. Witt says it’s easy to underestimate the value associated with planting urban trees. In the metro area, the biggest need for such projects is in Detroit, where Witt notes tree canopy cover is only about 18-22 percent. But the city is also where some of the metro area’s most inventive urban forestry work is taking place. Sayers notes that in his work, forestry is generally considered a function of local governments. But in Detroit some interesting major new projects are popping up on privately owned land. One such example is Hantz Woodlands, a project of the financial services firmHantz Group. 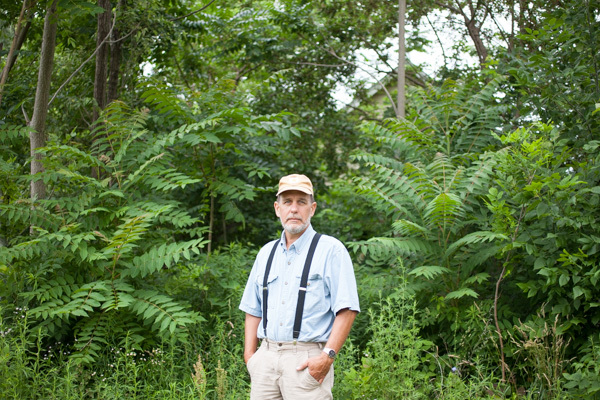 Hantz purchased roughly a square mile of vacant land across scattered sites on Detroit’s east side in 2013 and has since planted it with 20,000 trees. Hantz Woodlands president Mike Score says the project involved removing trees that he describes as “weeds,” including paulownias and mulberries, and replanting with trees including sugar maples, white birches and more. Score says the new forest is a safer and more attractive neighborhood landmark than the preexisting “thickets,” and notes that Hantz is working with local schools to conduct educational programs on the site. Two hundred Southeastern High School students were among the volunteers who helped with Hantz’s spring planting this year. Score notes the plots also have a broad variety of short- and long-term commercial uses. Another unique element of Detroit’s forestry situation is the fact that most new planting on public land is handled by the Greening of Detroit, the nonprofit Witt represents, while the city itself is still struggling with a backlog of dead and otherwise under-maintained city trees. Although the Greening waters and maintains any new trees it plants for their first three years, Sayers cautions that it’s important not to “put the cart before the horse” by placing too many new trees on the city’s already-overfilled plate. Witt says there’s an “interesting conundrum” in the dynamic between urban forests and overstressed city services. Of course, the city isn’t the only part of the metro area that could stand to benefit from urban forest development. The Greening is currently making plans to partner again with one such initiative in Royal Oak, which has been slowly spearheaded over six years by one Royal Oak native. Since 2009, Serena Egigian has been organizing to plant a corridor of trees alongside and in the median of Woodward running through Royal Oak, Huntington Woods, Berkley and Birmingham. Egigian worked with the city of Royal Oak, the Woodward Avenue Action Association, and a landscape architect in drawing up a project plan, which was completed in 2012. MDOT contributed about 150 trees to the project and the Greening planted them the same year. Egigian then became disengaged from the project for a couple of years due to the deaths of both her parents, but she’s recently thrown herself back into the effort, bringing on board A.J. Desmond and Sons Funeral Home to partner with the Greening in offering memorial trees along Woodward for bereaved families. Egigian admits that the trees planted so far are only a small step towards her total vision, and that it will take “years” to complete the project. But as a self-described “concerned citizen,” the motivations behind Egigian’s effort are much the same as some of the benefits cited by an urban forestry professional like Witt. The relationship between plants (especially trees) and happiness is something often discussed within the confines of an office. The importance of a healthy tree canopy within urban settings really presents opportunities for growth and rethinking the use of trees. Great article!